Individuals who wish to become a plumber will find constant work if they develop the proper skills and abilities. Plumbers work in some of the worst conditions to ensure the proper flow of water through buildings. The job can be tiring and often involves long hours, but it can be rewarding when it leads to helping people through difficult times. To become a plumber, individuals will need to spend some time learning the skills necessary for the job in a hands-on approach. The job of a plumber is multi-faceted. There are numerous aspects of repair and installation these individuals provide for both residential and commercial buildings. Generally, the job of this professional is to ensure water is able to flow into the home or building properly to be at the disposal of the user. It also involves ensuring water (including waste water) can flow away from the home, back into the sewers properly. To do this job, professionals need more than just to know how to fix a leaky faucet or how to snake a drain, though. Plumbers often work alongside construction crews during the installation of new piping. Most cities have specific building codes that must be met to ensure that health standards are met. Plumbers also provide inspection and maintenance services to residential and commercial buildings on an ongoing basis to ensure that there are no unknown problems occurring. Some work as sole proprietors, running their own businesses and traveling from one house to the next providing service on an on-call basis. Others work in plumbing businesses or through government organizations providing service as needed. Construction teams also offer these professionals as well. To work as a plumber, individuals need to obtain the proper education and certification to do so. Most students will have some postsecondary education, usually in a trade school. Additionally, an apprenticeship program is often a component of this professional’s training. Certification from agencies can help these individuals to get jobs in the field as well. Apprenticeship programs help the individual to gain more education and hands-on training (for example, this apprentice program in California). Some states require licensing of plumbers as well. This may include meeting specific educational guidelines and achieving standards on an ongoing basis. Individuals who wish to become a plumber will first need to complete high school or to get the equivalent. From there, students often enroll in vocational programs or in a trade school. Some high school seniors can enroll in vocational schools prior to graduation. This may be an option in some states. Trade school education generally takes between one and three years to complete. The student will learn a variety of things, including some basic construction skills, how to read blueprints, and how to handle investigative work regarding these systems. The use of various type of machinery as well as aspects related to plumbing methods is also a component of this education. According to PlumbingApprenticeshipsHQ.com, the student will need to enroll in an apprenticeship program. This program can take between four to five years to complete. The specific amount of time for apprenticeship education will range based on the state’s requirements. Generally, these individuals will need to have 144 hours of classroom education as an ongoing education. This may or may not be offered by a plumber’s union. States set the terms of the requirements for continuing education. 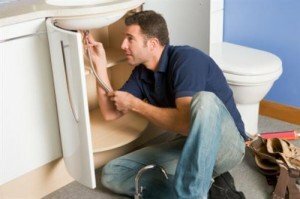 People who want to become a plumber need to know more about the availability of jobs. According to the Department of Labor’s Bureau of Labor Statistics, jobs in this field are likely to grow at a faster than average rate. For the period of 2010 through 2020, an additional 107,600 jobs are likely to be added. Additionally, the agency reports that the 2010 median pay for individuals in this field was $44,660 per year.